Some high-quality scanners, like the Epson Expression 1640XL, 10000XL and 11000XL, facilitate to adjust the optic’s focus. 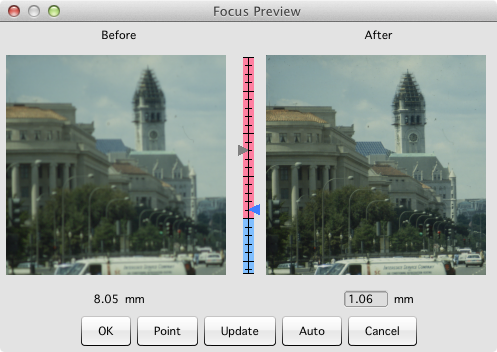 This means the possibility to offset the focus up to several millimeters above or below the regular focus level. Using SilverFast 8, the scanners mentioned above and some others feature an automatic focus control system. Additionally, the user is enabled to set the focus manually. What do you do with a Focus Control? You don’t need a focus control, if your originals really lie perfectly flat on your flatbed. However, using filmholders slightly lifts your originals, slide mounts are of different thicknesses and also filmstrips inserted to film scanners are not always perfectly flat, the focus can vary from frame to frame. Setting an appropriate focus leads to crisp and sharp images. Flatbed scanners, which feature a focus control, may also be used to digitize certain three-dimensional objects like coins. Click below to open Focus Control movie or PDF manual.